You must make reservations at least 5 minutes in advance of the time at Anchor Bar. Live Music and Events every weekend! Check our Facebook page for more details. See you soon! Mention the Open Table Discount for $5 OFF your purchase of $25. This is valid at this location on Transit Rd. in Williamsville only! Please Check out our Website for our Catering options! Great deals and delivery are available daily! This Anchor Bar Restaurant located on Transit Rd. in Williamsville has dedicated itself to providing the most pleasurable dining experience in Buffalo. 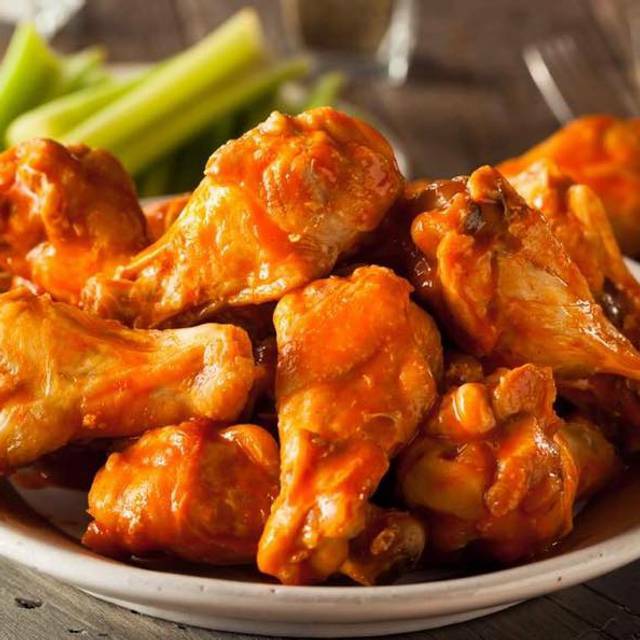 In addition to Buffalo Wings, we prepare the finest Italian and American cuisine from our own original recipes. It keeps our customers coming back for more. Home of the Original Buffalo Chicken Wings! For more than 40 years we have been making perfection! White pizza was good but wings were somehow dry. Had a great time!! Our server handled us with class as we needed four separate checks!! The service was quick and excellent. 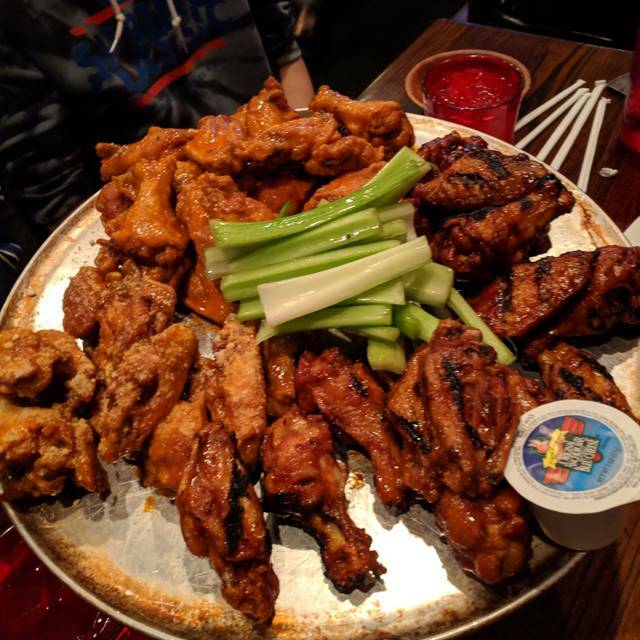 I was visiting from Philadelphia and wanted to have anchor bar wings. They did not disappoint!! Great service for our table of 7. Our server was attentive and very kind. I would definitely return to this Anchor Bar location and recommend to others. The wings are pretty good, if you love hot and spicy wings, then this is a good choice. The floor was sticky, the wings were too hot - ordered medium. The temperature was too cool. The bill was too expensive for what you received. The service was good. Food was good and as expected. Suicidal wings were tasty and chili was good. Went during rest. week and wasn't impressed. For a place that is famous for its wings all I can say was that they were below average. Dessert was very good though. The wings were delicious and mixing the different flavored wings is fun. The fries were delicious. A must try restaurant while in Buffalo. Enjoy the wings! We had a great time! Interesting decor with a feel that this place has probably been transformed a few times to fit the era. Roast Beef on Weck was good (along with the accompanying gravy). We also got the 'hot' wings. I think we would have like the option of getting 10-15 wings, but with two or three sauces so we could try more. We didn't see that option. Great place with a lot of history! I only wish I could’ve visited the Original on Main Street, downtown. Service was a little slow. Cocktails were crafted in a non traditional way. Pizza was under baked. Wings were fine. They never checked the reservations on open table luckily they had a space to fit us when we arrived. I made the reservation 4 days in Advance for 10 people then I added 2 more on the day of reservation. Very Good Wings. I had to try them from the originator of the Buffalo wings. Really enjoyed having the same quality of food and menu choice as the original without the wait. Food and service were excellent. Parking was plentiful as well. Very good food and service. Love taking clients and out of town business associates here to give them the Buffalo wing experience. If you want to wait for service go here. We had a table of 11 which turned into 13 with no added accomdations for the additional guests. It was noon and nobody was even in there. Service was slow. The food was great. The service was awesome. 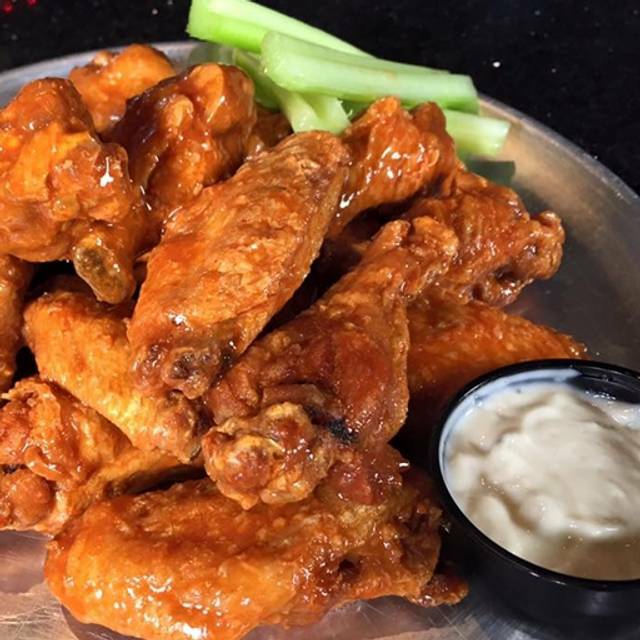 You haven't had wings till you've been to the Anchor Bar. The wings are huge, cooked to perfection and sauced just right. I'd drive to Buffalo again just to have them. So glad they've opened a location in Toronto! both games going on so we enjoyed that. Excellent service. We stopped in for a quick bite in between a couple of sports events. We're a family of 5 and a few of us have celiac disease, so we got a fully gluten free meal. The gluten free options were fantastic - separate fryers for the wings, almost all sauces/rubs were GF, GF chicken fingers, etc. As far as we can tell, nobody got sick, service was excellent, food was decent with some excellent wings (as it should be). Overall a great (if too quick) stop, will definitely stop here again. Fast service and tasty wings! Yuck. At least we can say that we have been there. Nothing but mediocre fried food on the menu. The Italian grandma who invented the original Buffalo wing must be rolling over in her grave. Won't be back. My husband unlike me was not a fan of chicken wings, but Was converted after our wings @ Anchor Bar. Have tried others but these were the best....exactly as ordered...hot & crispy. Great wings! Especially the BBQ!! Service beat by none!! The wings are as advertised; and the other food was as very good. The service was a bit slow. There were very few people there that night, the staff was not busy and they hung around in groups while we waited for service at various points. I would of complained but the manager was in the middle of the group. When it is busy I can understand, but there were like four tables total, I shouldn't need to wait 10 minutes for a refill. 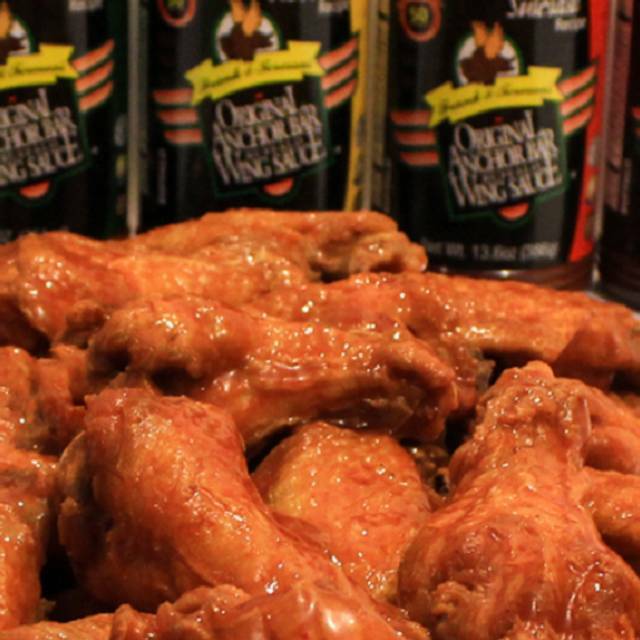 Great Old School Wings from the place that originated them! Everything was good. We were disappointed to learn that the $5 off $25 purchase mentioned on the website would not be honored. No explanation was given. They do not take Open Table reservations. I brought it up to the hostess and she looked at me like i was crazy. I dont think she had ever heard of the app. I waited about an half hour (i wasnt upset about it,i realize what i was walking into) before i was seated. I sat right next to the band so dinner conversation was near impossible. I assume other tables would have been more comfortable but at this point in time we were just lucky to have a table. The wings were good but their appetizers were definately the high light of the meal. Iconic name - birthplace of the chicken wing. Not an iconic location - franchise in a suburban strip plaza. Food was good quality and quantity. Service was friendly and competent. For the real experience, try the Main Street city location. The food was very good however we had to constantly get our servers attention as she was busy socializing with other servers . Management needs to be on top of this or business will fail. The wings were mediocre at best. Spaghetti was disgusting, water with red food coloring. Mozzarella sticks how do you mess that up? They did. The wings were NOT worth the hype. Waste of time. Loved it! Went for the wings but also had a great sub sandwich. Server wasn't overly personable but got the job done. Wings lived up to their reputation! The food was just ok but the waitress was fantastic!! The salads are so small and they cost $11-13 crazy!! I would only go back If I was in the area definitely would not go out of my way again. Not a fan of anchor bar, but if I had to choose what one to go to this one or the one downtown I would pick this one! Loved the wings and the atmosphere. Will definitely be back!